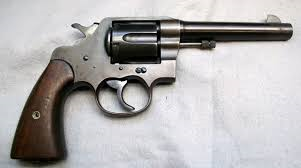 Used as a side arm, mainly by American officers. This was a six shot revolver firing 0.45 inch bullets. It weighed about a kilogram and was 270 millimetres long. It was first issued during the First World War but was still in service during the Korean War and would even be used by tunnel rat units during the Vietnam War to clear Viet Cong underground tunnel systems. Love your podcast. Great insight and detail. However I do find it hard to keep focused on the narrative when all the unit numerical designations are discussed. Might there be another way to discuss unit movements in a less precise manner, while adding detail when warranted to emphasize a point?